How It Works. These companies deliver a portable storage container or a mobile storage trailer to your residence. You are then responsible to load it, and they return to pick it up and ship. People who use this option don't have to worry about all the headaches of driving a large rental truck to their new home because the company will do it for you. This option is typically used for moving longer distances, but it can also be a good option if you only need temporary storage. Your two most popular companies that fill this niche market are PODS and ABF. Make sure you check online to see if they service the area you live in and the area you are moving to. Portable Storage Containers vs Mobile Storage Trailers. 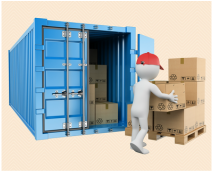 One of the most popular portable storage container companies is called PODS. They serve their customers by delivering a small mini-storage unit to your home. These containers usually fit nicely in an average driveway and range in size from 7 ft - 16 ft. An advantage of using this option is that these containers are ground level for easy access. The leader in mobile storage trailers is a company called ABF. This company is actually a trucking company that delivers one of their large freight trailers to your home for you to load. It's important to know that these trailers were originally designed for freight not household goods. Their trailers are 28 ft. long and typically can hold a 3-4 bedroom home. One advantage is that ABF has good nationwide coverage and is able to service most areas. Important Details To Consider. Regardless of which option you may use, make sure you understand all of your charges so you don't go over budget. Because these companies aren't actual moving companies, they may not have extra moving equipment. Make sure you check on the price and availability of packing materials, dollies, and furniture pads. Remember that your items will get damaged if they are not well protected during the loading process. Also check out your options for insurance before accepting a quote. Adequate insurance can save you a lot of stress if your items arrived damaged at your new home.